I’m a huge fan of dumb, sarcastic humor, so naturally The Oatmeal has huge appeal for me. 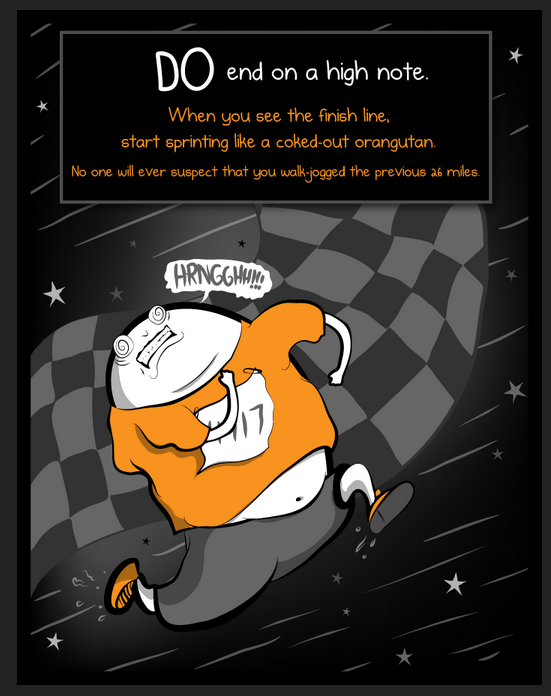 In true BylMiles form, their latest comic is centered around marathons, and let me tell you, it’s fantastic. Check it out on their website here, with a sneak preview below. As runners, it’s important to laugh at our own insanity sometimes, so hope this puts a smile on your face for your next race. As always run (and laugh) on runners. Finally, the congratulations I’ve been waiting for…I’m officially entered into the Marathon! Huge thank you to everyone who supported my fundraising for Team R4V. Because of your support, I was able to raise over $600 to support our vets! I’ve never run a race as part of an organization before, but am proud to be part of this team. Team R4V is much more than just a ‘show-up-for-your-t-shirt-and-swag’ team, it’s a group of athletes who are dedicated to supporting our vets and supporting each other. Within a day of registering, I was added as part of their Facebook group, where fellow runners from all over the country are posting about their upcoming races, receiving support + inspiration, and providing helpful tips for their fellow team members. Don’t get me wrong, I’m all about free t-shirts, but it’s feels great to be a part of something bigger. Training is officially in full swing (it kicked off with bootcamp can you believe it?!) with many more details to come. Has anyone else ever run as part of a bigger team or organization? Curious to hear your experiences! I am pleased to announce that the entry saga of the Marine Corps Marathon 2014 is over….we are IN! Honestly, this year’s registration for the MCM was worse than applying for colleges. (Sorry MCM, I love this event, but it was a hassle) As you’ll recall, team BylMiles was planning on getting into the marathon through the 17.75 event that guaranteed you a spot in the big race. Well, 9 minutes of registration for the 17.75 went by while I was on the phone and BAM – sold out. 9 minutes, no joke. Then a stream of texts from friends that were also trying to get in confirmed the same thing: none of us were running the 17.75. Our next order of business was to register for the lottery. I’m going to be very open and say that I really don’t agree with races that have a lottery for entry. Not only is it nearly impossible to get your whole team in (even for just two people!) against those odds, but the stress of waiting for your acceptance is unbearable. Nevertheless, we registered for said lottery about a month ago, and patiently waited…until today. While refreshing four different tabs on my computer, we waited for the big “yes” emails saying we were into the run. Quick props to the MCM social media people for keeping their pages updated + letting people know that emails were still being sent out. About three hours into our wait, my dad gets his email – he’s in! So, at this point we just need the second email to make our 2014 MCM dreams come true. And tweeted hopefully at the MCM team. No lottery entry for me fellow runners, I was bang outta luck. Now, of course, panic sets in. No lottery entry means that I need to find some other way to get into the race. Enter Team R4V. I had never heard of this organization before, but they were ready with their posts calling for racers to join their team that hadn’t made it into the lottery drawing. After a quick scan of their website, I was sold. Team R4V is a non-profit that provides assistance to all branches of military veterans through athletic races/fundraising – how awesome is that?! So, you are looking at the newest member of their team! I’ll be fundraising as part of my participation, so be on the lookout for more info here on how you can support Team R4V (and of course, my race!). To everyone who made it into the lottery, congrats! To everyone still looking for a bib, I feel you pain, best of luck in your search! 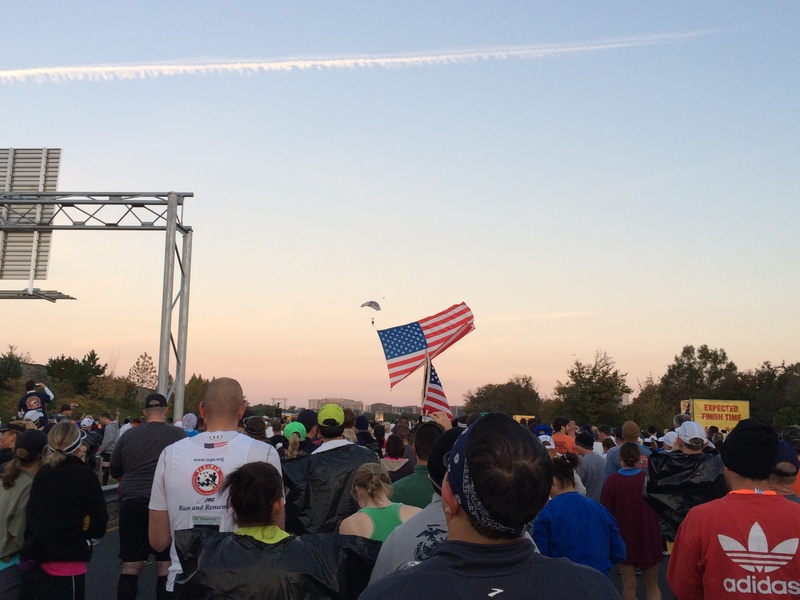 And now, for the sentence I’ve been waiting to write since we entered the lottery a month ago…Marine Corps Marathon 2014 – HERE WE COME! As always, run on (marathon) runners. It’s official, my flights for the Marine Corps 17.75 in DC are booked! It’s going to be one of the quickest running turnarounds of my life (in DC for roughly 24 hours, including the race), but it’ll be worth it. I’m going to let you in on a little-known fact relating to this race, which eventually made the BylMiles Team decision to run it. This year’s Marine Corps Marathon has officially switched to be a lottery entry. Now, if you have ever experienced the stress of a lottery entry race before, you know that you would do just about anything to avoid it. ever. again. Luckily, the MCM team created a little loophole. This year’s 17.75 race in April is the one race that if you finish, guarantees you entry to the marathon in October. BINGO! As someone who is running as part of a team, we wanted to ensure that we could run the marathon + get in together. So, Marine Corps 17.75, here we come! The April countdown is officially on, then only a few more months after we cross that finish line until MCM round 3. Seeing as my training is ramping up in anticipation for this race, wanted to share this awesome/totally true article from one of my favorite blogs: 25 things you learn when you train for a marathon. Like I said, not exactly lofty, but not a walk in the park either. 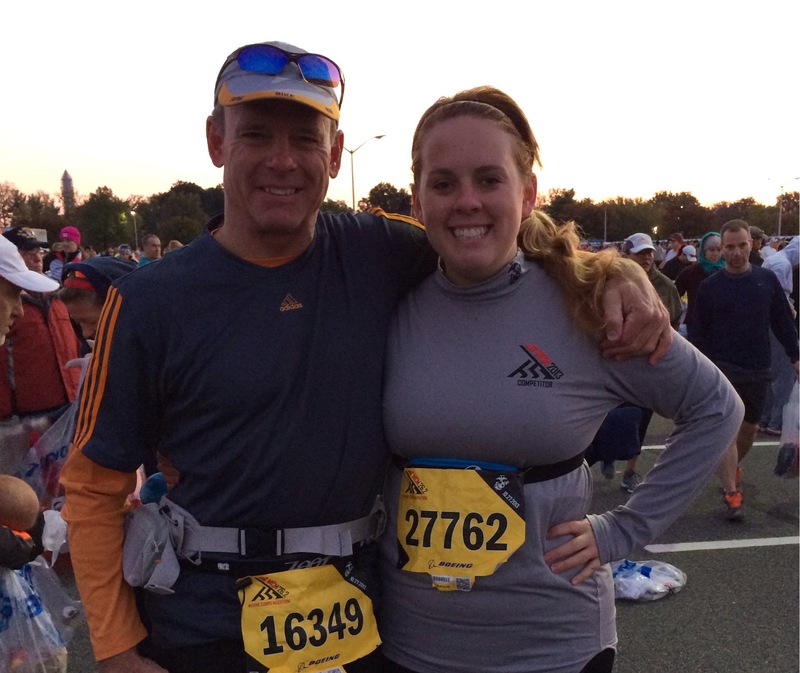 You’ll remember that in 2013 (how weird is that…LAST YEAR) I ran the marine corps marathon with my dad in october. Pardon my french, but as a refresher, it kicked my a**. So, what better way to hop back on the horse than to sign up for the exact same race and get it done this year? MCM 2014, here comes the Byl Miles team for Round 3, get ready. So, #2, become a biker. If you’re a regular fan of #BylMiles you’ll know that my dad Michael is quite the biker extraordinaire. Triathlons + 100 mile bike races are the norm for who we affectionately refer to as ‘Mile Man’. He doesn’t know this yet, but my goal of becoming a biker in 2014 includes signing up for a future bike race with him. (Surprise dad! More races to come!) But since I don’t own a bike, helmet, or have any sort of biking experience other than leisurely rides on the beach or sitting on the bike at the gym, this is going to be an undertaking…but one that I’m very much looking forward to. There you have it folks, two goals to hold me to in 2014. What are your goals for 2014? Any new fellow bikers out there to join in with me? As always, run (or bike) on runners. P.S. I’m hoping you’ll see more of BylMiles posts this year as well, so feel free to prod me into keeping you updated on our progress! She wants to move by N.E.R.D. There is nothing like a marathon. Every time we head to DC for the marine corps I am reminded of the dedication, determination and excitement of everyone involved. Runner, volunteer, Marine or spectator, you can feel the energy that this race gives off. This year, my dad and I queued up again with 30,000 of our closest friends for the gun to sound. As the national anthem blared, we looked up to see about ten parachuters gliding down to us with flags. They landed in and amongst the runners while the whole crowd cheered. Honestly, it was one of the coolest sites I’ve ever seen. Rock on Marine Corps. The gun sounded and we waddled our way towards the start. For those of you who haven’t yet experienced the hurry-up-and-wait of a marathon start, your heart is pounding and your bouncing up and down, ready to go, but your surrounded by a mass of people on all sides, and there’s nowhere to go until you officially cross the start line. In typical marine fashion and as expected as a second-timer, the race was very well-organized, plenty of water stations and bathrooms. My only complaint was that we didn’t get food, oranges, until mile eight (two years ago, we got this two miles earlier, made all the difference!). Now, it was right around these oranges that my run started to go south. My feet had started to hurt, so I popped two Tylenol to take the edge off, but the real problem was my stomach. For those of you who don’t know, I’ve had pretty bad stomach issues for the past month and a half. Found out that I’m basically having a bad reaction to a naturally occurring bacteria in your body (so not awesome). So, of course, my stomach decided to put up a fight to all this running. We ran on, until mile 10, where I literally left my mark on the race course in the most un-attractive way possible, by puking. Shout out to the woman who congratulated me with a spirited “better out than in!!”. I shook it off, and ran, much more slowly, onwards. We hit the next aid station where hero #2 of the race traded me one of my citrus goos (my stomach = no citrus for now) for a chocolate one. At this point, my stomach started throbbing, literally. I won’t go into gory details, but a shirt we saw on our run sums it up nicely: “Nothing can stop us now, we’re champions, going str….wait, hang on, dry heaves!!”. My dad, the most awesome running companion you could ever ask for, started walking with me during mile 14. I won’t lie, the tears were flowing, I was crushed. It was taking everything I had to keep going, but all I could think was, just keep moving. We came around a bend and found the American University pep band cheering us on. When they saw my alumni shirt, they started going nuts, yelling at my dad and I to just keep going! But, at this point, both my dad and I knew there was no way I was going to make it the last 10 miles to the finish. In true solidarity, he ran with me the last mile (no matter how much it hurt, I refused to stop my race on a walk), to where our friends and family were waiting at mile 16, our finish line. I’ve never not finished before. Slow, tired, hurting, I’ve been all of these things, but I’ve always pushed through and made it across the line. To say that I was devastated was an understatement. After months of prepping and getting excited, ending everything early felt like a cop out. Admitting that I had failed felt even worse. And then, after the love + encouragement from my friends and family had finally gotten under my thick skin, I decided to quit feeling bad. Sure, I didn’t make it to the finish, I don’t have a medal to prove it, but I ran my heart out. A marathon is just a distance, that’s all. I ran 16 of those 26 miles, and know that I left everything out on the pavement, there weren’t any miles left in me. Now, I’m picking myself up, dusting off a rough run and getting my head in the game for the next one. The best part of all this? I have even more motivation for next year. MCM 2014 is going to be the race to end all races (and even if it isn’t, I’ll know that I did everything I could). Congratulations to all of my friends that completed the MCM 2013, so proud to have run with you!! Can’t wait until next year!! As the countdown to the Marine Corps Marathon ticks on (and the threat of the gov shutdown canceling the race looms) I’m reminded of last year’s MCM 10K. For some quick backstory, I hadn’t trained nearly enough for the marathon and decided to postpone my run until this year and ran the 10k instead. I had a group of family & friends running with me in the MCM 10k last year which made for a hilarious start line. 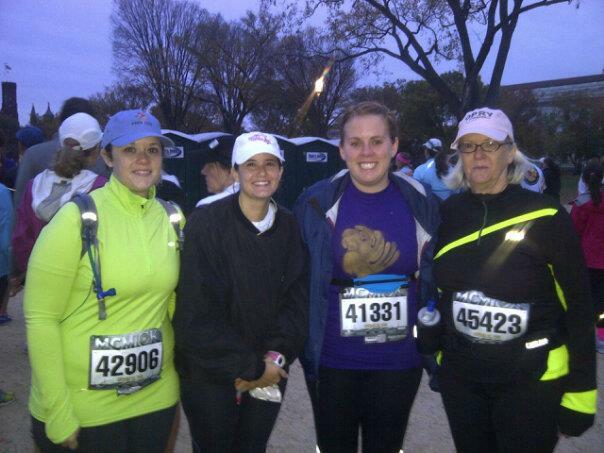 We danced on the balls of our feet out in the cold and rain on the National Mall until the gun sounded and we took off. If your looking for a great view on your run, this is the race for you. You kick off running towards the Capitol building and continue to follow the National Mall. The course is actually part of the Marine Corps Marathon run, which is great because you get the gorgeous tour of DC monuments during the event. Also as per the marathon, the race was extremely well organized, filled with spectators and hosted by our favorite men + women in uniform. The course is pretty flat, and has plenty of sites to see (including a drum line!) along the way. Would highly recommend to any first timer or repeat 10k runners. You even get to cross the finish line at the Marine Corps memorial and receive your medal from a marine! Post race, there is plenty to eat/drink and of course, you’ll want to stick around to watch the winners of the marathon cross the finish line about an hour later. A quick tip for 10k runners (also applicable to marathoners): be ready to walk a ways to get to the start and also when you finish the race. Even though there is plenty of public transportation, you’re one of over 30,000 runners + spectators that are trying to use the same few stations. Much easier in my experience to get off the public transport a few stops away from the main ones and walk to wherever you need to be. Shout-out to all of my friends that will be running the 10k this year again, have a blast! In the meantime, fingers crossed that the MCM 10k and MCM can still happen in just 12 days time. As always, run on runners. Allow me to preface this post by saying that I’m really excited to see all of these fun 5k events popping up. People who aren’t runners can get into it without feeling pressured to compete and possibly find a fun new (healthy!) hobby. However, even though this event was considered a ‘fun run’ there were far too many issues with it in my book to be considered a success (sorry Living Social). One of my running buddies and I decided to enter this as a fun, easy run. Glow sticks? Beer? An end of run concert? We thought, sign us up! From the moment we showed up though, it was clear that this event wasn’t well put together. First, we couldn’t find the sign in tent. We ran around (we were a tad late) and finally located an unmarked pop up tent that was handing out shirts + bags. After collecting our glow sticks, we then ran back to the start line, fully expecting to have to jog right through the start. But we waited, and waited. And finally the race started 45 minutes after scheduled. The race started late, and even though kind of a bummer, not the end of the world. 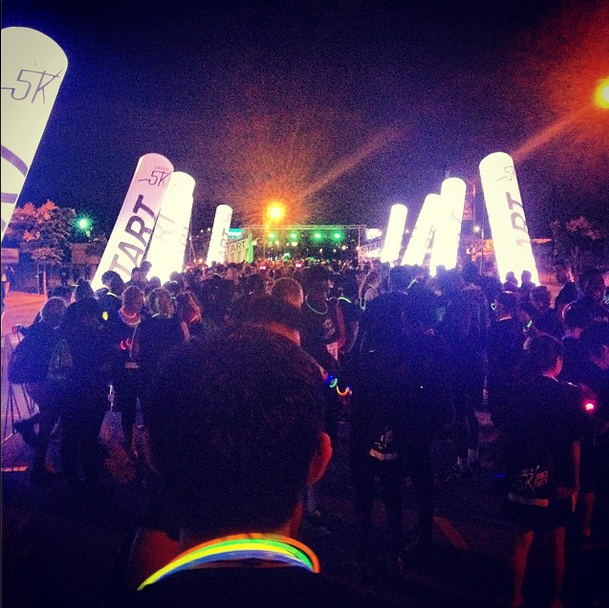 All of the glow sticks + loud music were getting us hyped up so we ran out of the start line and began our trek. Not five minutes into our run though, we realize that the course is barely lit and is not only on un-even ground, but there are obstacles (literally speed bumps, rocks, curbs etc) that we have to dodge as they appear. Not cool Living Social, I have zero time for a sprained ankle. But, we keep going, we’re here and there’s beer + music at the end. We keep running and finally find the only water station at 2.9 miles in. After kicking up dust, our tiny dixie cups are a welcome gesture, but a little useless that late in the run. The finish line appears and we head on over to toast our success at the beer tent. Walking up to the counter, we are then informed that the beer we were told was free as part of the event is actually $7 and they are even charging us $3 for water. No beer, and no water…total bummer. Once more people started crossing the finish line, realizing the beer + water wasn’t free, and began to depart (the dance party wasn’t exactly rockin when people realized what the deal was) we decided to call it a night ourselves. Overall, completely unimpressed + would not recommend this run to even beginners trying out a fun running event. And so ends my rant of the underwhelming glow-in-the-dark 5k. As always, run on (but maybe not at a living social event) runners.